Bluetooth is used by millions of people, but what is it and why is it growing so popular? Bluetooth wirelessly transmits data via low-power radio waves and serves as a way to connect two digital devices. We are living in a digital age and like our technology, Bluetooth is changing and becoming more advanced. Originally, Bluetooth was primarily used in laptops and cell phones as a way to exchange various forms of data between them. In recent years, we have experienced a technological and social change that has given rise to numerous portable audio devices. These improvements in technology are transforming the uses for Bluetooth and have allowed it to become a more practical wireless communication and audio solution. Regardless of your preferred music device, there is a high probability that your music will be streamed using Bluetooth wireless connection in the near future. Bluetooth is readily available on new Cell Phones, Stereos Systems, PCs, MP3's and is even being factory installed in new models of cars. As well, there are devices available that make it easier to wirelessly play music using Bluetooth. The newest of these devices are Bluetooth FM Transmitters, which can be plugged directly into a standard Car DC adapter. 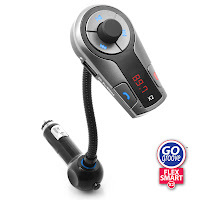 Not only do these transmitters play music through the car speakers, but they are capable of answering phone calls. When a call is received, the music will automatically shut off and allow the user to talk through their car speakers. There are also advances in bluetooth headphone technology, which is great for music lovers. 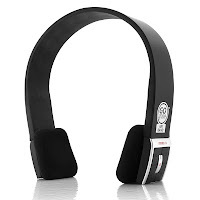 The new Bluetooth headsets connect to any Bluetooth audio device and allow the user to freely listen to music without cords. The new AirBand Wireless Bluetooth Stereo Headset has wireless music playing capabilities and hands-free calling integrated into it. This single bluetooth device can play music and allow you to take phone calls. currently being developed and is going to revolutionize data transfer. It is fast enough to stream video footage from camcorders, digital cameras will be able to stream photoslideshows to cell phones and laptops will have the ability to wirelessly transfer presentations to a projector. The possibilities are truly endless and have the ability to not only eliminate wires, but the communication barriers between multiple devices. Accessory Genie plans on keeping up with these advances and providing the most advanced Bluetooth devices on the market.